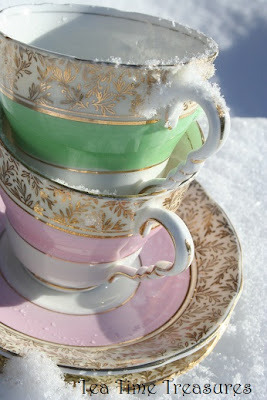 Here is a pair of simple, yet beautiful tea cups﻿ that I wanted to share today for Tea Cup Tuesday. I am joining Martha's Favorites and Artful Affirmations...thank you for hosting! I found this great green tea cup at a garage sale (like most of my tea cups!). I liked the delicate leaf pattern against the simple green. Then came the pink one. I found this one at an estate sale. The lady had a very extensive teacup and china collection, and it was difficult to choose which ones I wanted to take home. I thought it would be perfect to have a matching pair, so I picked up the pink one. A quick search on the web showed me that there are bright blue, light blue and yellow versions of this tea cup. I also discovered there is a matching teapot. For now, I’ll enjoy my set of two! I read somewhere that these cups were produced in the late 1940’s. ahhh beautiful teacups! love the colours and the gold leaves! so shabby chic! Such lovely teacups. I hope you find at least one of every color as you travel along life's road and that they are a real good price so you can have a complete set. Hope you are having as real good day. Really really gorgeous! These are just the kind of tea cups I would chose out looking for some. The colors are so pretty together. Thanks for sharing. Your Royal Stafford tea cups are so pretty! I always love gold patterns. You were really lucky to find two of these.